There are some photographs of Friese-Greene’s early film experiments that seem to have been wilfully ignored by historians writing about the beginnings of cinema. My guess is that this is because explaining and dating them is problematic – and because to attempt to do so might disrupt the status quo of academic opinion around Friese-Greene; which is that he failed and lied and can be safely ignored. So I’m going to attempt to both explain and date them, because they may represent Friese-Greene’s Eureka Moment. The place where his plans finally came together. These photos are of artefacts in the Will Day Collection, which has resided in the Cinématheque Française since the late 1950s, when British museums let it be sold abroad, regarding it – as the curator of the Kodak museum put it – as “a load of junk with a few nuggets”. Now, however, it is recognised as a vital source of information about the beginnings and development of motion pictures. Will Day was visionary in his understanding that this was history that needed to be recorded through gathering documents, films and equipment, whilst talking to surviving participants. He did this enthusiastically and was a relentless champion of the importance of Friese-Greene’s work, but he was, to say the least, an erratic and unreliable historian – which did neither Friese-Greene, nor himself, any favours in the long run. 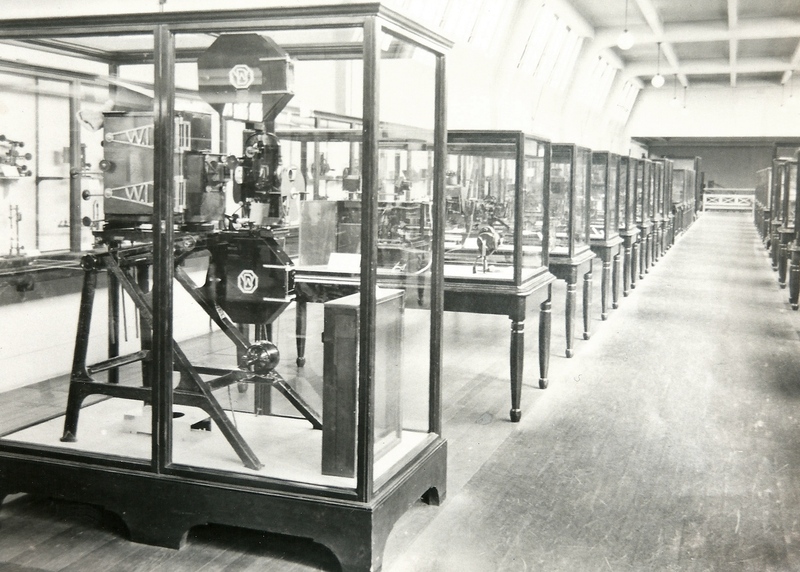 In August 1922, a year after Friese-Greene’s death, he first showed a collection of 500 artefacts in the South Kensington Museum (now the Science Museum). From the picture at the top of this article, you can see it was pretty impressive. There was a whole display case dedicated to Friese-Greene’s work. Many of these items remained there on indefinite loan for decades. Ten years on, in late 1932, he made a selection of 64 items for the Royal Photographic Society’s annual exhibition. Looking through the list of what was shown, it’s worth stopping to scrutinise items 45 & 47 [#46 being what Day said was Friese-Greene’s first ever celluloid film – but that’s for another blog post]. And here is Will Day holding up #45, that roll of paper negative film, with an indecipherable image on it, followed by a couple of clippings featuring the strip of celluloid film #47 (reversed to be positive), from sources as disparate as the British Chemist & Druggist from 1955 and the American Moving Picture World from 1927. So, according to Will Day in 1932, the strip of paper film is from 1885, although he appears to have changed that to 1888 on this photo. And Day says these other frames were filmed in Kings Rd, Chelsea in June 1900, but then later said it was in November 1889, whilst the Moving Picture World (on the right) says they are from Brighton in 1889. The Chemist & Druggist doesn’t venture a date but does say it’s in the Kings Road. So that’s crystal clear. Isn’t it? If Will Day knew Friese-Greene as well as he claimed, then they must surely have had conversations about all this, but the impression one gets is that Day made no notes at the time and later made up a chronology from poorly-researched guesswork and half-memories. He then appears to have amplified some of his errors over time, occasionally correcting others. So that means that we’d be best off ignoring almost everything he said about dates and checking for ourselves. In the earlier parts of this post, we established that Friese-Greene had spectacularly crashed and burned at the start of 1891 and was hung out to dry financially over the course of that year. Not only were his household belongings sold, but he had claims from debtors flying at him. He wasn’t allowed to borrow money and you can be sure that all those clever scientific instrument makers who built his inventions would not be offering him a line of credit – or even an invitation to come round for a cup of tea, when he’d defaulted on paying his bills. So he couldn’t possibly have had a moving picture camera constructed – be it a new design or a copy of an earlier model. But, as we have seen, he had held onto the ones that were already built and in his hands (if not paid for in full). We know for sure about the two that he showed off at the Royal Institution and he had the others tucked away, safe from the bailiff’s grasping hands. But what were these cameras like and how many were there in the first place? Friese-Greene’s own account of which cameras he had made and in what order, is not terribly clear – on one occasion he says there were four different ones, but five made in all. We know that he had a model of the working parts of a moving picture camera built in 1889 and later that year, the completed camera was ready. We know that with Frederick Varley he developed a stereoscopic (3D) camera in 1890. We know that a second stereoscopic camera that was meant to double as a projector appeared later that same year. And in late 1890 and early 1891 there are several mentions of yet another camera. This camera does not appear to be stereoscopic, but at photographic societies he and Varley show bands of film taken with it with 400 exposures on, which they say are typically recorded at 5 frames per second. It seems likely that it was this last camera which was shown at the Royal Institution on Feb 6 1891, alongside a stereoscopic one, the day before Friese-Greene had his household goods auctioned off. So, there we have five cameras constructed, but the first two or the stereoscopic two could be regarded as of the same type, which just might fit Friese-Greene’s account. But what was it like, this last camera? How was it different from the other ones? There’s no description I’ve come across so far that can help answer that, so I’d prefer to look back at those inscrutable images above of people on a street and work backwards from there, asking: what sort of camera might have taken them? Allowing for shrinkage with age, the film is probably of the celluloid rolls that were manufactured by Eastman in 1890-91 to fit their popular “Kodak No. 1” camera – 2⅝ in wide (67mm) – so that would have been easily available at that time. But it definitely wouldn’t have come with holes along the edge. Friese-Greene did say that he had the scientific instrument makers A. Légé & Co, who built some (possibly all) of his cameras, make him a couple of custom hole punches to perforate both sides of the film simultaneously. Close examination of the film shows that groups of holes are well aligned, then there is an irregular space, then a regular group – suggesting that the film had to be punched laboriously by hand, leading to intermittent errors.